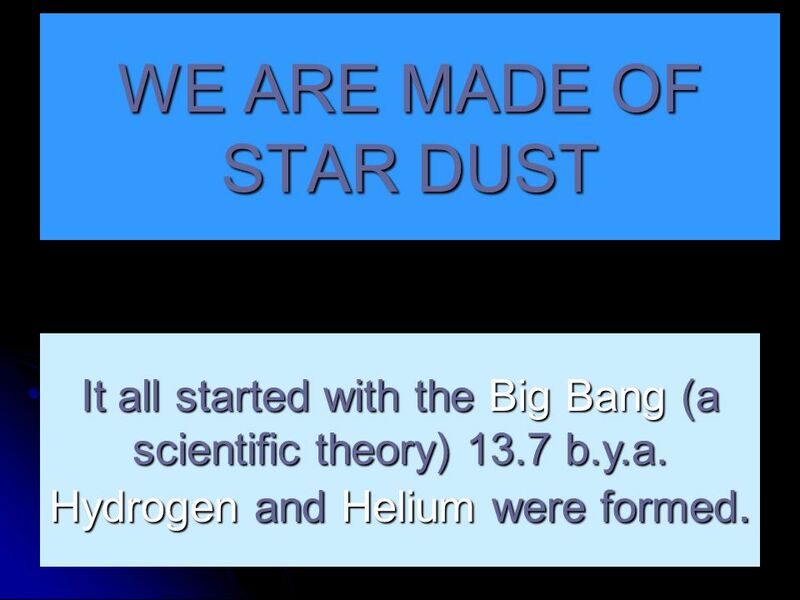 WE ARE MADE OF STAR DUST It all started with the Big Bang (a scientific theory) 13.7 b.y.a. Hydrogen and Helium were formed. 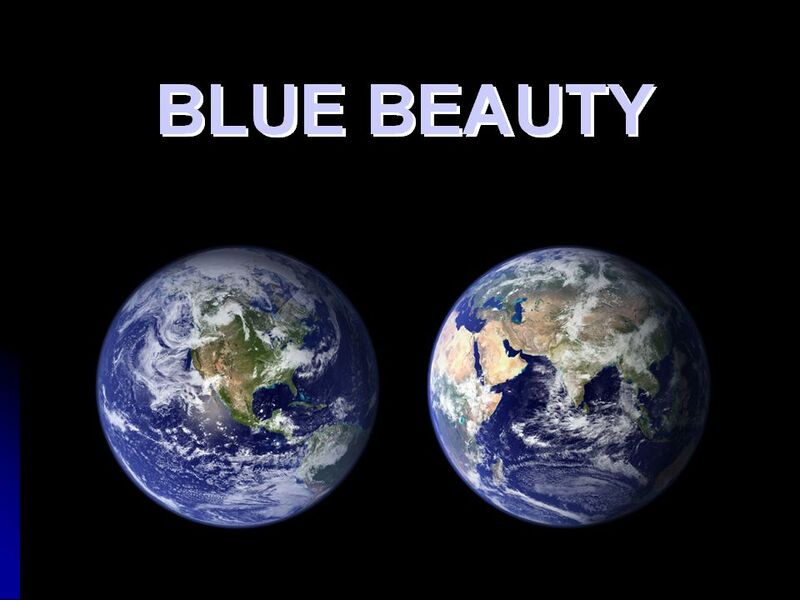 1 WE ARE MADE OF STAR DUST It all started with the Big Bang (a scientific theory) 13.7 b.y.a. Hydrogen and Helium were formed. 2 Are we truly made up of stardust or where are all the elements formed? 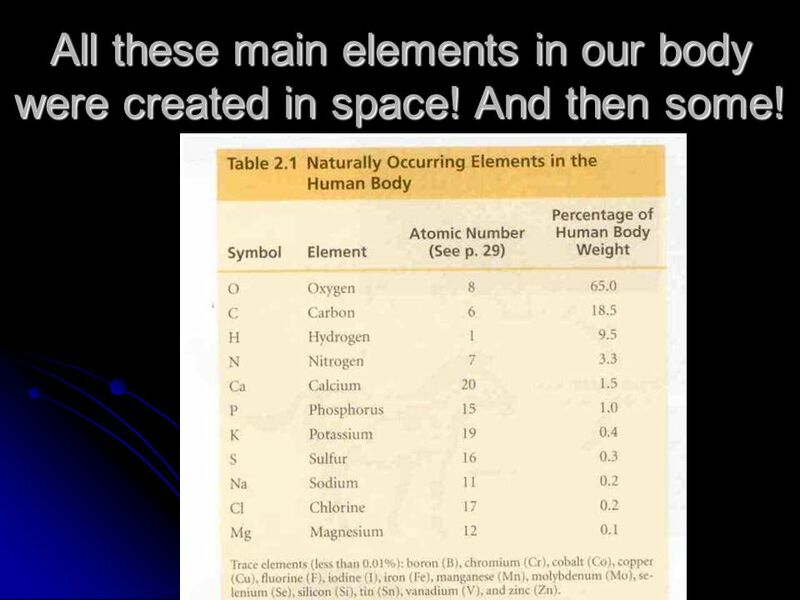 All these main elements in our body were created in space! And then some! 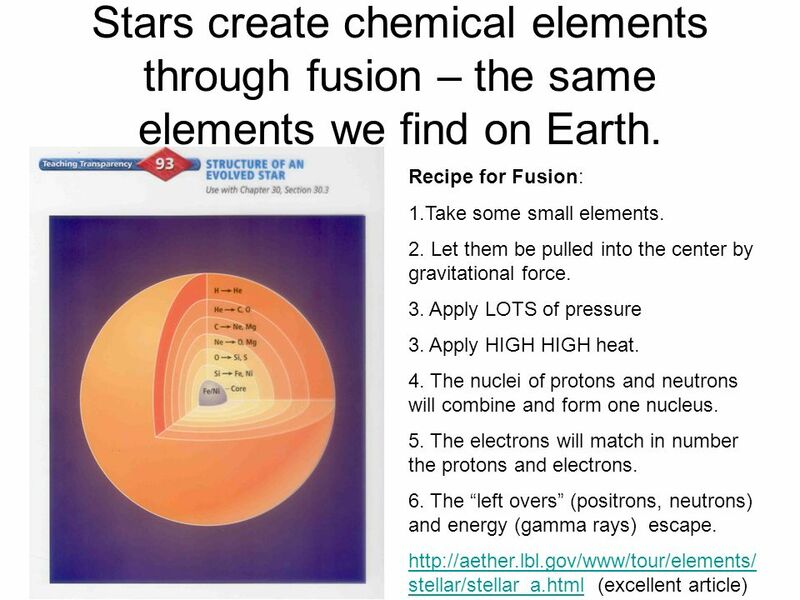 4 Stars create chemical elements through fusion – the same elements we find on Earth. 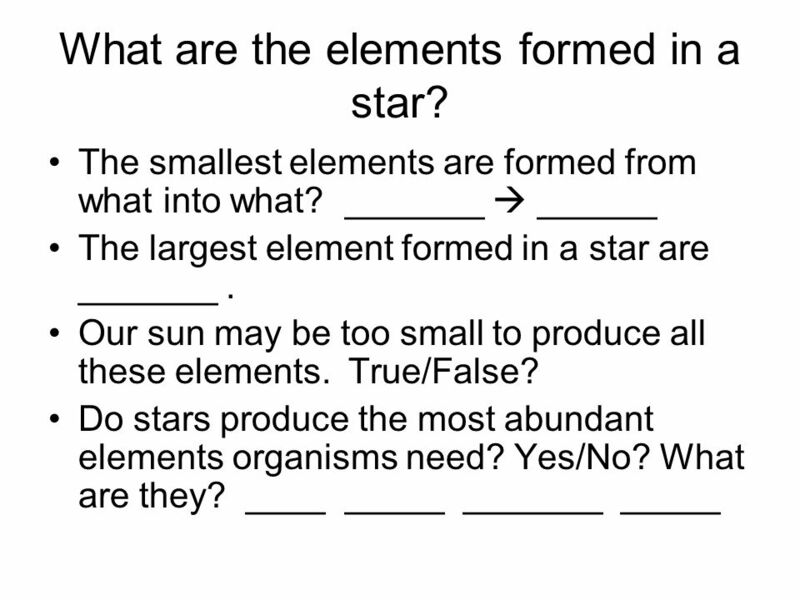 5 What are the elements formed in a star? 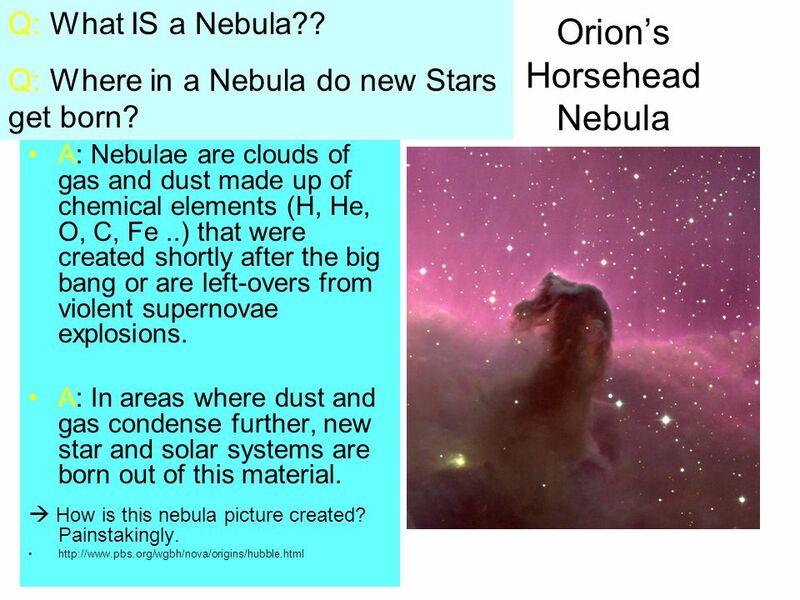 Q: What IS a Nebula?? Q: Where in a Nebula do new Stars get born? Orion’s Horsehead Nebula A: Nebulae are clouds of gas and dust made up of chemical elements (H, He, O, C, Fe ..) that were created shortly after the big bang or are left-overs from violent supernovae explosions. 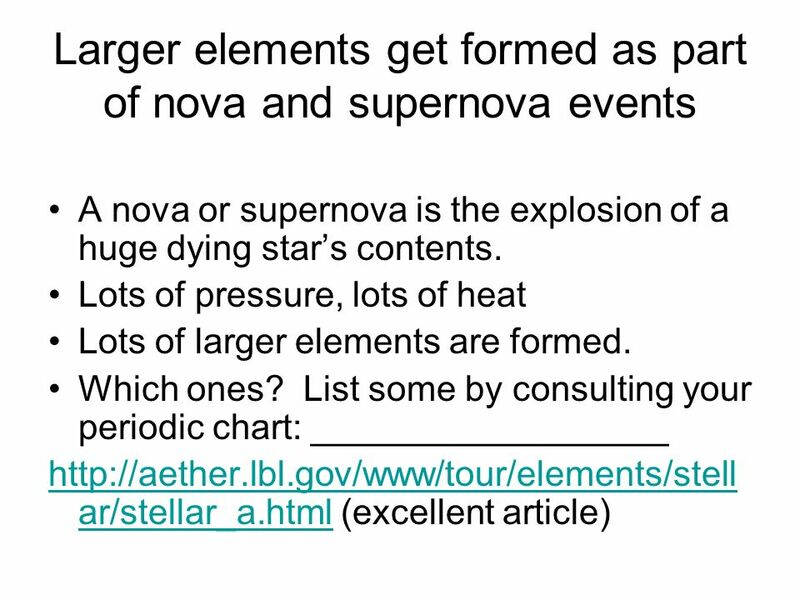 A: In areas where dust and gas condense further, new star and solar systems are born out of this material.  How is this nebula picture created? Painstakingly. 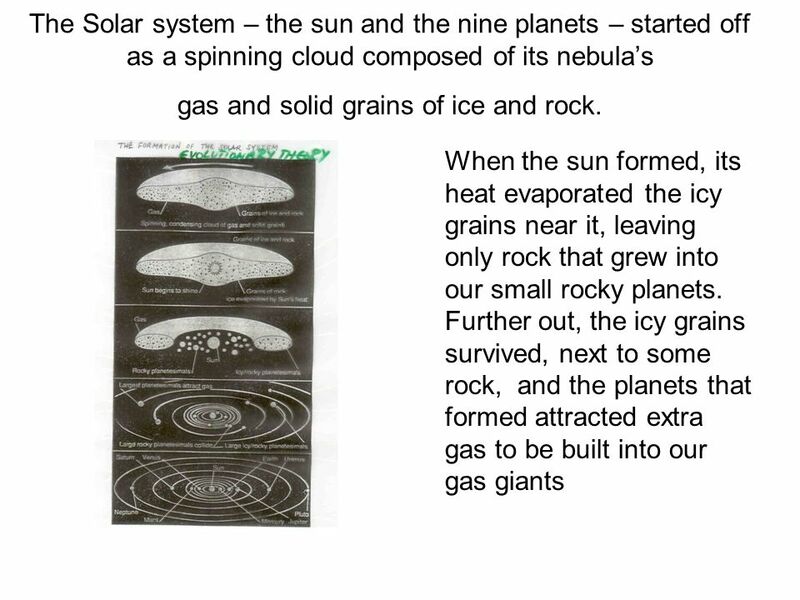 8 What is a nebula made up of? 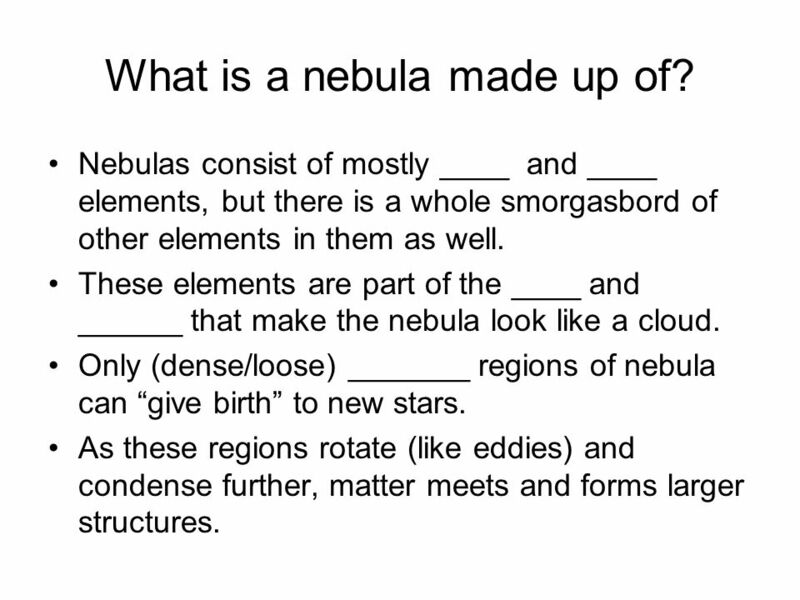 Nebulas consist of mostly ____ and ____ elements, but there is a whole smorgasbord of other elements in them as well. These elements are part of the ____ and ______ that make the nebula look like a cloud. Only (dense/loose) _______ regions of nebula can “give birth” to new stars. As these regions rotate (like eddies) and condense further, matter meets and forms larger structures. As material rotates and condensed, two things happened: 1. 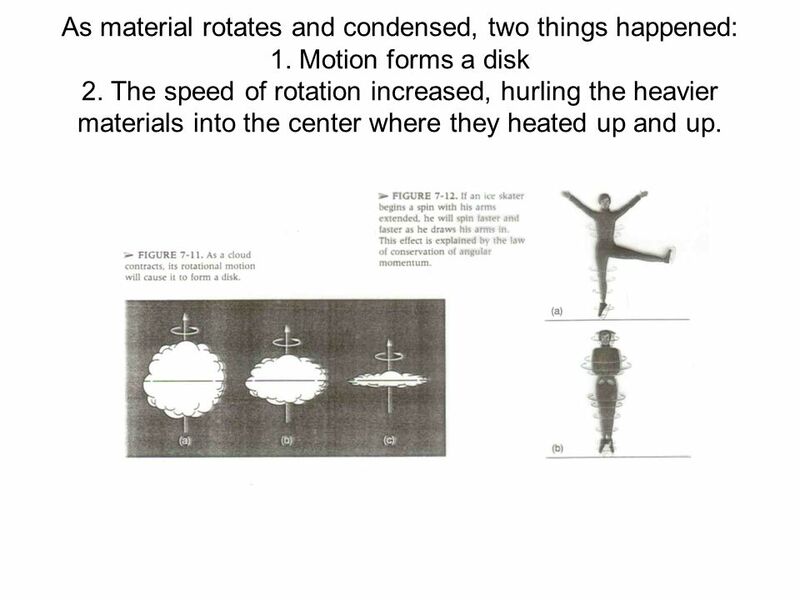 Motion forms a disk 2. The speed of rotation increased, hurling the heavier materials into the center where they heated up and up. 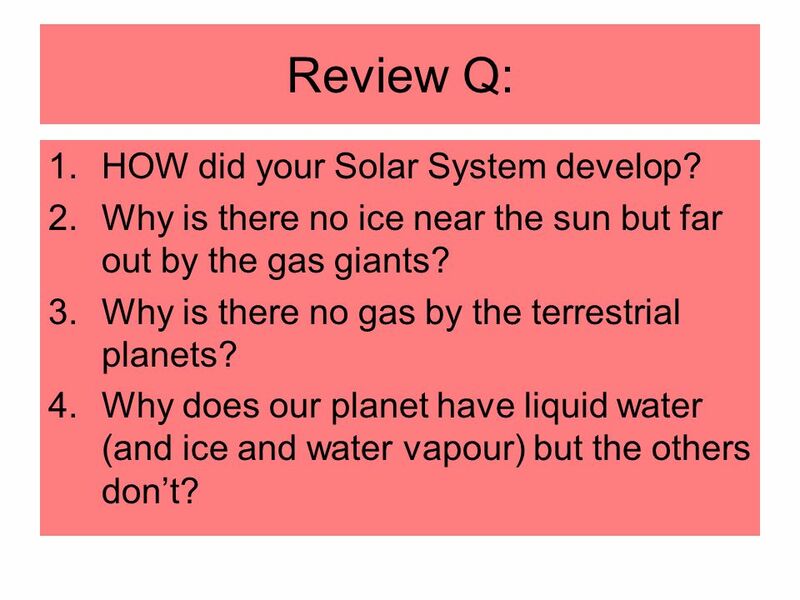 11 Review Q: HOW did your Solar System develop? 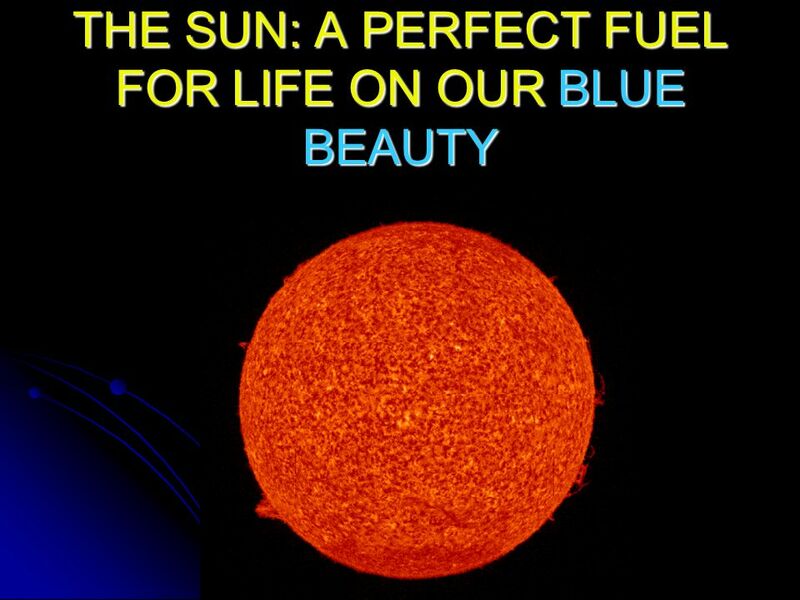 Why is there no ice near the sun but far out by the gas giants? Why is there no gas by the terrestrial planets? Why does our planet have liquid water (and ice and water vapour) but the others don’t? 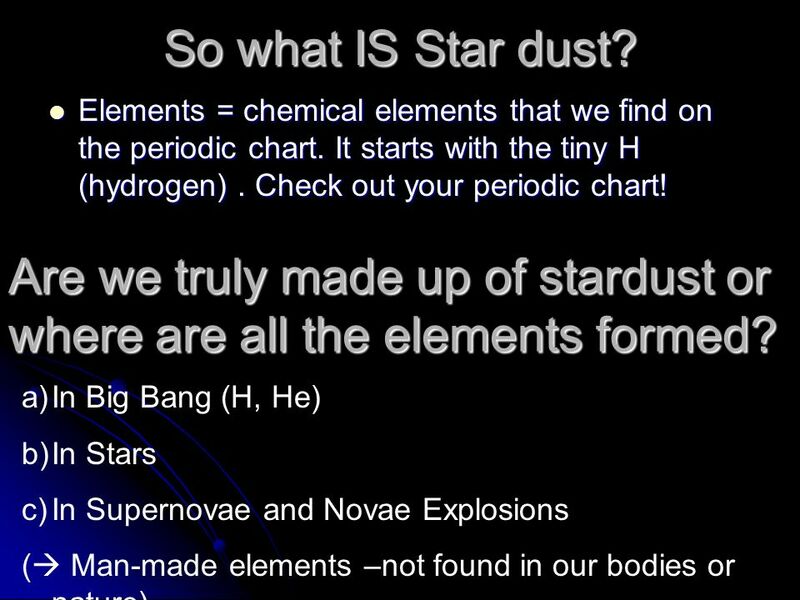 12 We Are Made of Stardust Big Bangs produced the H and He. 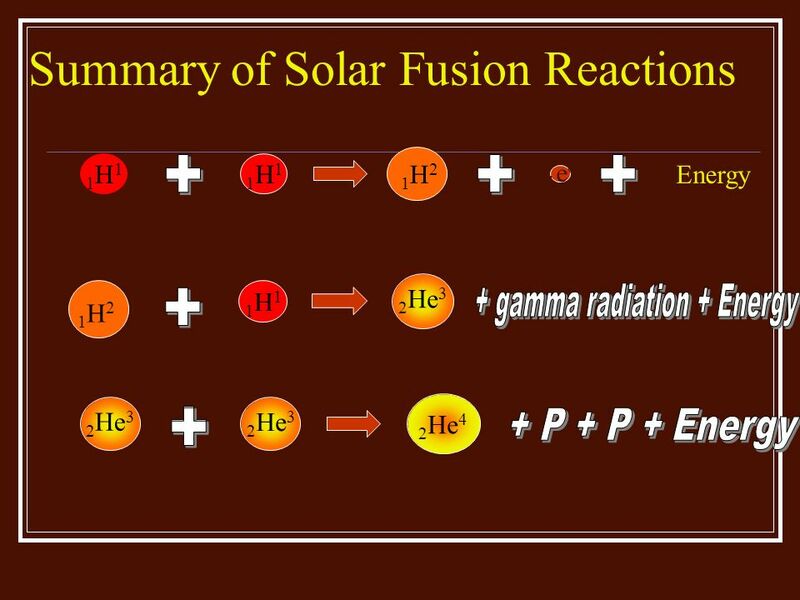 Stars form chemical elements (He, C ..) through fusion in their center. At the end of their life stars explode and free these elements that get collected into nebulae. Nebulae are nurseries of new stars and solar systems now contain these elements. Our solar system also “inherited” these elements. So when Earth formed, these elements were its building blocks. And we humans, earthlings, are made up of just these same elements ( H, He, C .. ) made once upon a time and put into the nurseries of stars, the nebulae.. Cycling of Matter recycles these elements – our stardust – over and over again. We are made of Stardust – we are components of the Universe. 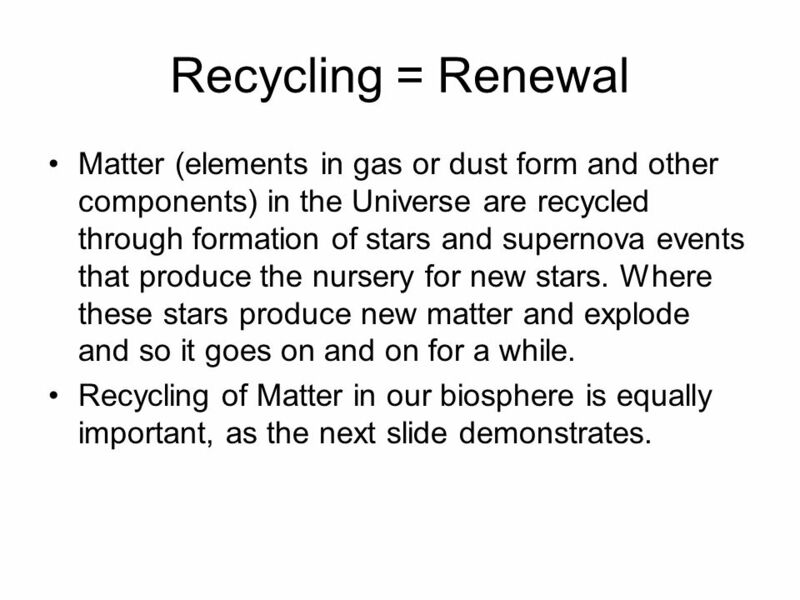 13 Recycling = Renewal Matter (elements in gas or dust form and other components) in the Universe are recycled through formation of stars and supernova events that produce the nursery for new stars. Where these stars produce new matter and explode and so it goes on and on for a while. 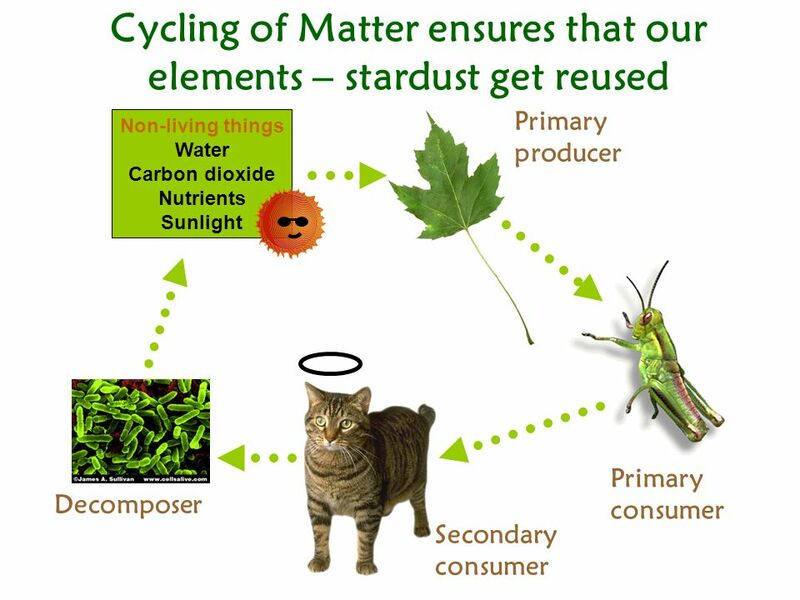 Recycling of Matter in our biosphere is equally important, as the next slide demonstrates. 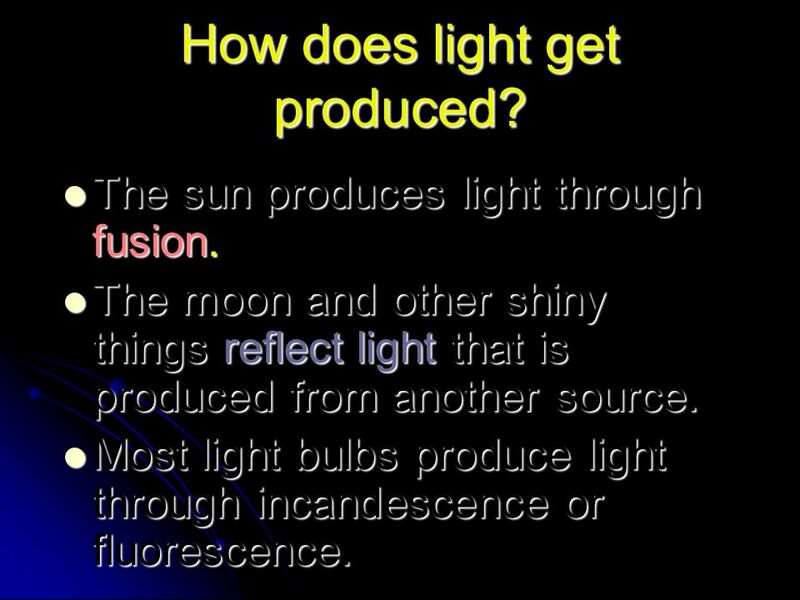 15 How does light get produced? 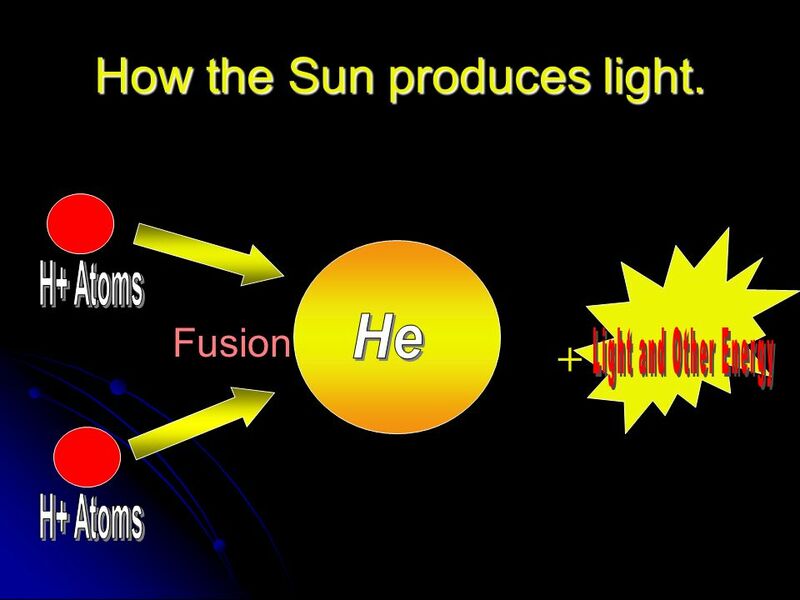 The sun produces light through fusion. The moon and other shiny things reflect light that is produced from another source. Most light bulbs produce light through incandescence or fluorescence. 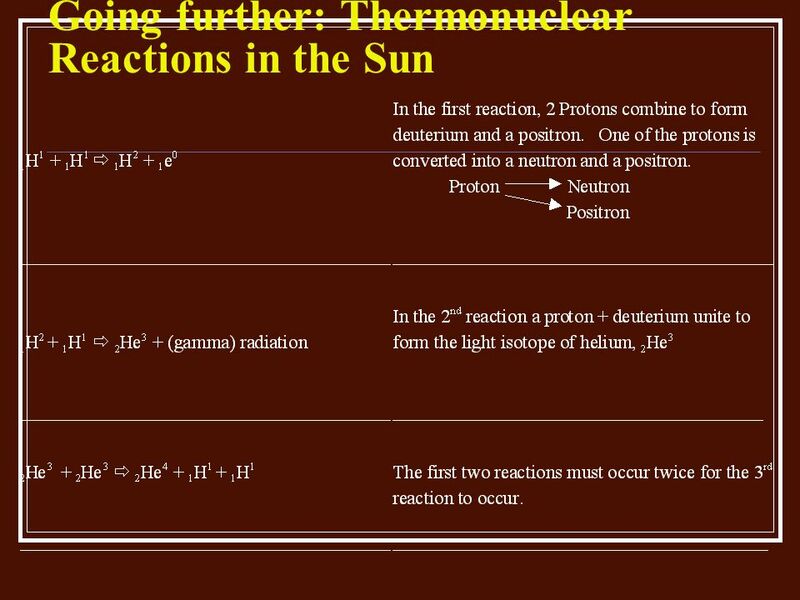 16 How the Sun produces light. 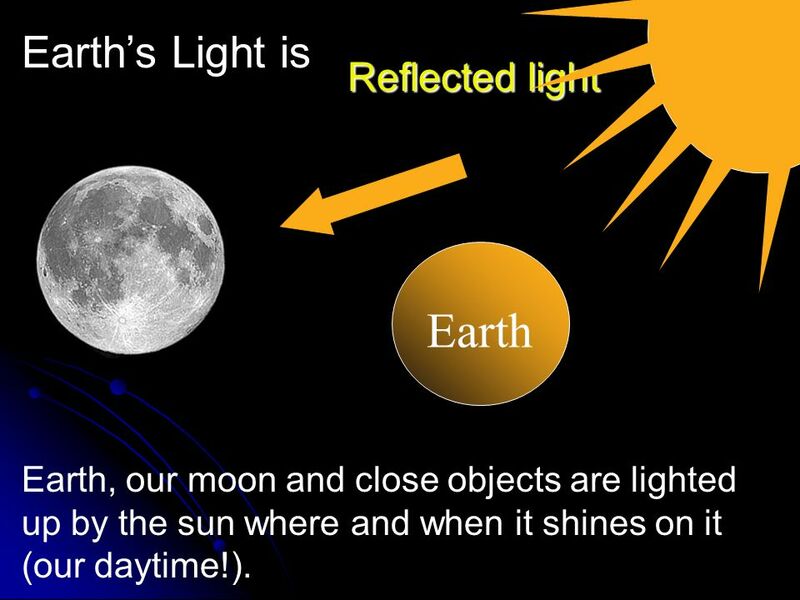 Earth, our moon and close objects are lighted up by the sun where and when it shines on it (our daytime!). 18 Incandescent lights Light is produced by heating up a wire with electricity until it is white hot. 90 % of the energy transformed as heat. 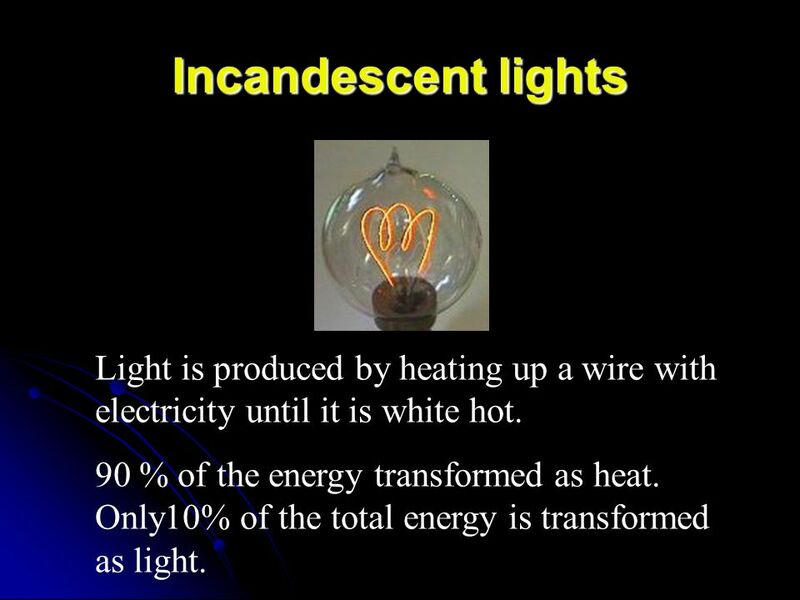 Only10% of the total energy is transformed as light. 19 Fluorescent lights The Fluorescent lights work because a ballast gives a high initial voltage to start an arch within the tube. The current is then reduced to just maintain the electric arc. 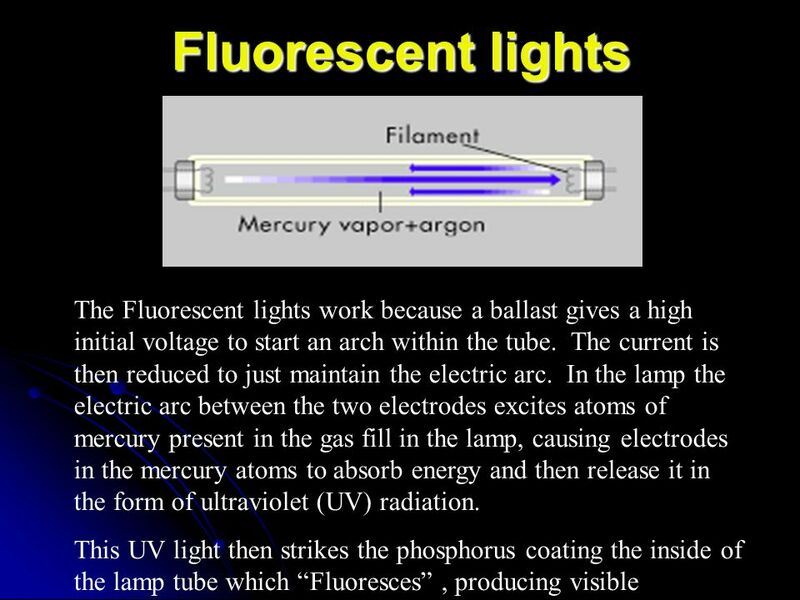 In the lamp the electric arc between the two electrodes excites atoms of mercury present in the gas fill in the lamp, causing electrodes in the mercury atoms to absorb energy and then release it in the form of ultraviolet (UV) radiation. This UV light then strikes the phosphorus coating the inside of the lamp tube which “Fluoresces” , producing visible light. 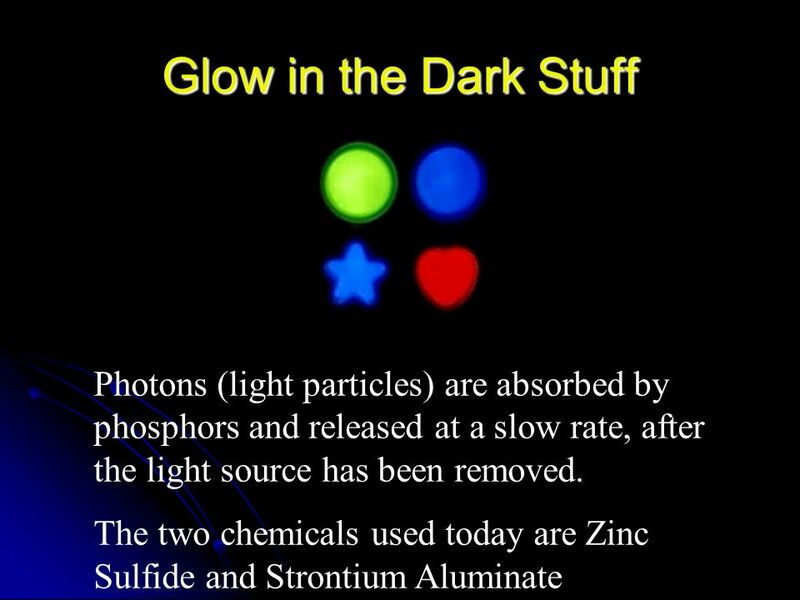 20 Glow in the Dark Stuff Photons (light particles) are absorbed by phosphors and released at a slow rate, after the light source has been removed. The two chemicals used today are Zinc Sulfide and Strontium Aluminate. 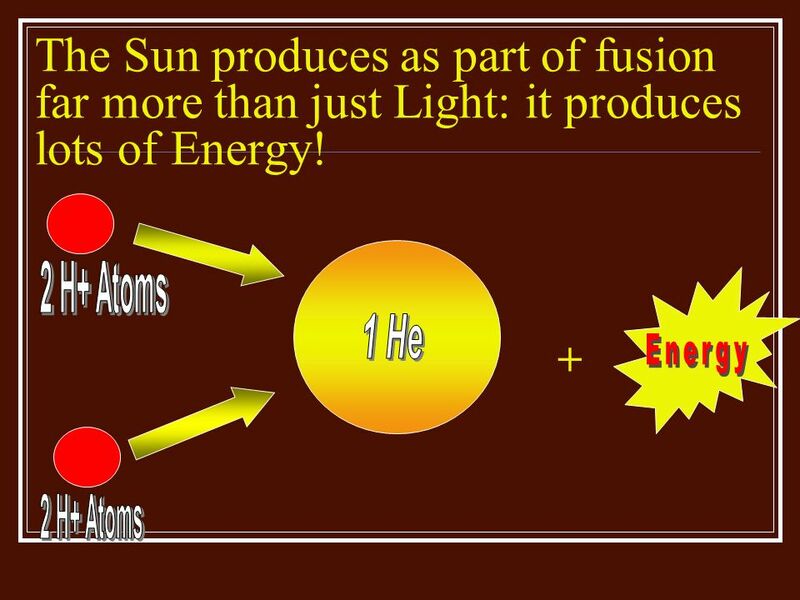 21 The Sun produces as part of fusion far more than just Light: it produces lots of Energy! 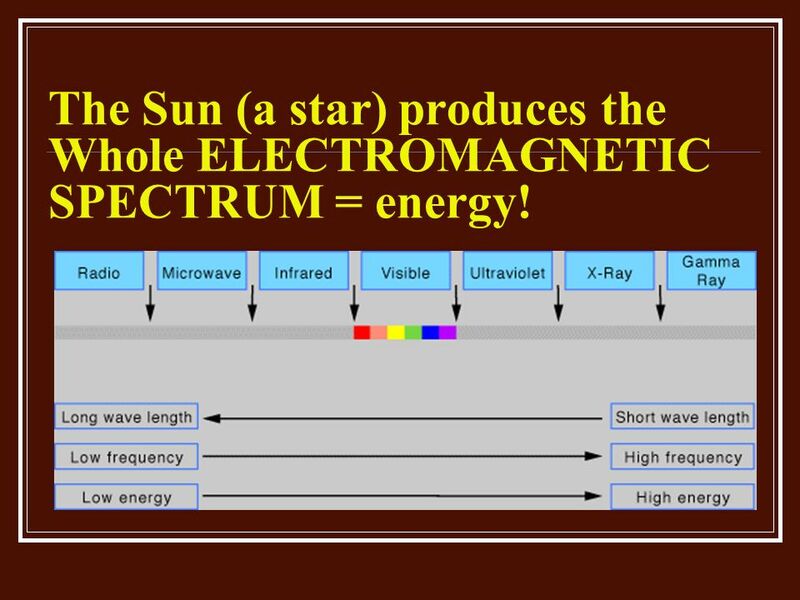 22 The Sun (a star) produces the Whole ELECTROMAGNETIC SPECTRUM = energy! 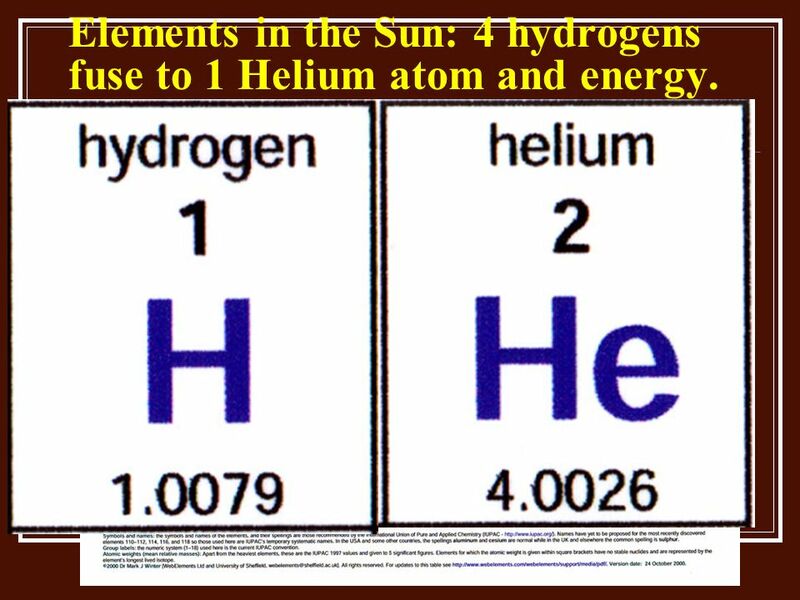 23 Elements in the Sun: 4 hydrogens fuse to 1 Helium atom and energy. 28 Can we run out of energy? 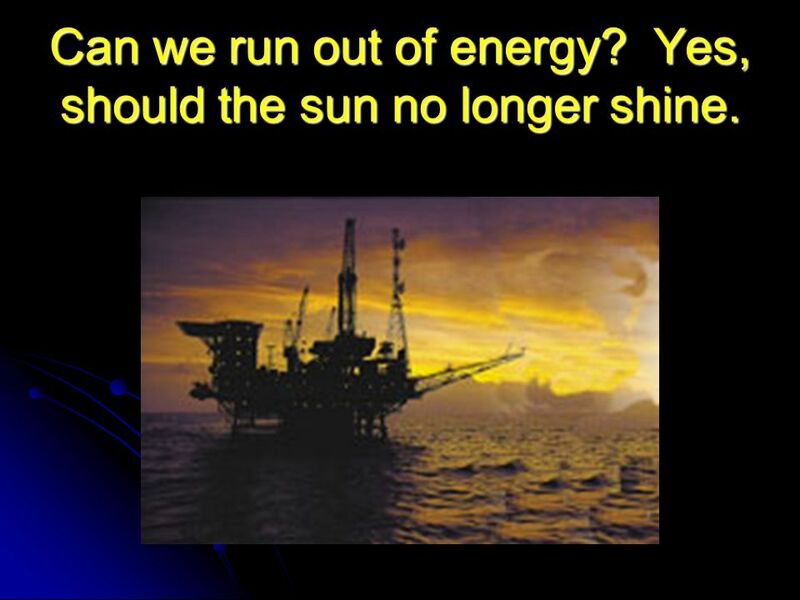 Yes, should the sun no longer shine. 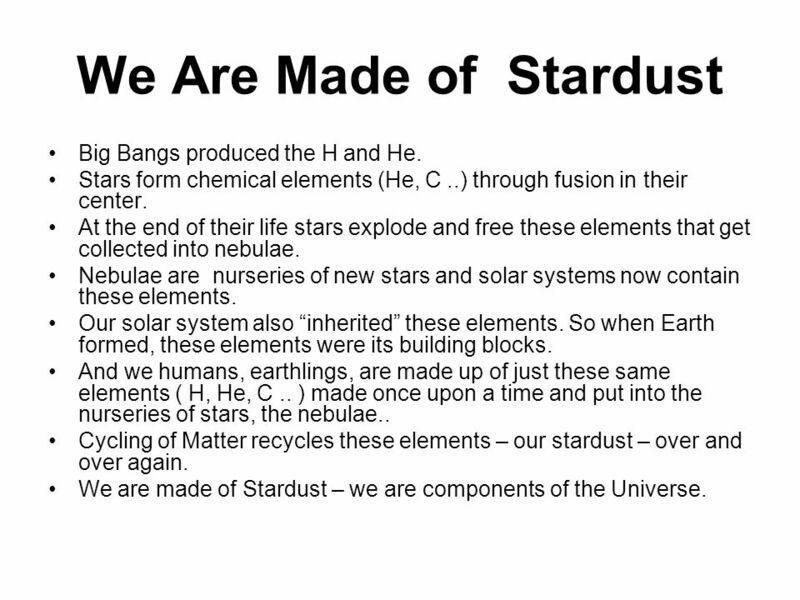 Download ppt "WE ARE MADE OF STAR DUST It all started with the Big Bang (a scientific theory) 13.7 b.y.a. Hydrogen and Helium were formed." Life cycle of stars Nebulae to supernova. Life Cycle of a Star. Stellar Evolution Describe how a protostar becomes a star. Fill in the chart when you see a yellow star. Take notes on the stars and events as well. Stellar Evolution: The Life Cycle of a Star. Stellar Nurseries All stars start out in a nebula (large cloud of dust and gas). All stars start out in a. The Nebular Theory, Matter, and Light 1. 1.Terrestrial, Jovian, and dwarf planets 2. 2.Nebular theory 3. 3.Matter – atoms and molecules 4. 4.Kinetic and. 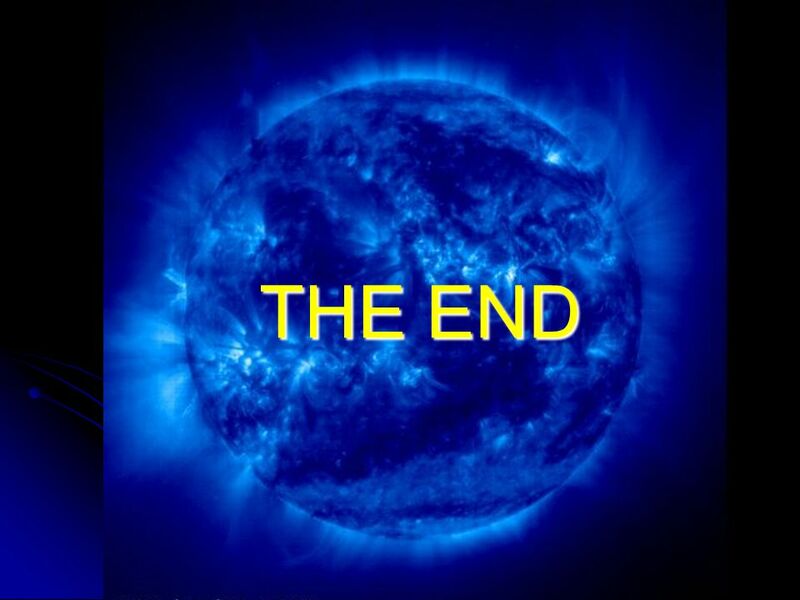 OUTCOME QUESTION(S): S1-4-08: What objects make up our solar system and Universe? Vocabulary and People CoreFusionNebulaSupernova Black holeGalaxyTerrestrial. 1 Chapter 2 Creation of Oceans. 2 Supporting Evidence for the Big Bang Edwin Hubble discovered spreading of galaxies. Cosmic background radiation (the.